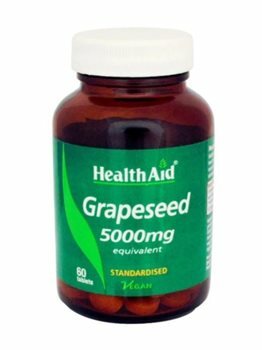 HealthAid Grapeseed tablets are formulated using pure top quality extracts with a very high percentage of Proanthocyanidins, the active principle in grape seeds. Grapeseed acts as a very powerful anti-oxidant and is good for the heart and general all round health. Grapeseed Extract derived from 50,000mg of Grapeseed powder. Adults and children over 12 years, two to three tablets daily or as advised by a suitable qualified person.